Tennis players are some of the fittest athletes but there are times when even the fittest of the fittest can’t bear the heat and humidity, facing cramps and collapsing to the ground in pain. However, there are players who keep fighting for the win despite struggling to even move. We have compiled a list of players who faced the most dramatic cramping moments. 10. Thanasi Kokkinakis (2015 US Open) Australian teenager Thanasi Kokkinakis looked strong to upset 12th seed Richard Gasquet and reach second round of the US Open for the first time as he led the Frenchman two sets to one. However, he started feeling cramps in his forearm and then in his legs. The Australian player took some on court treatments and kept fighting during the fourth set despite being unable to move freely. He even sent some underarm serves and hoped that he would be able to make a comeback but that did not happen. Kokkinakis finally retired from the match after dropping first two games of the final set, losing the match 6-4, 1-6, 6-4, 3-6, 0-2 Retd. He said after the match, "It's just frustrating because I started playing good tennis. I was getting fired up. One-all, 30-love in the fourth set, I was bouncing the ball. Then, yeah, immediately I started to feel my forearm go. 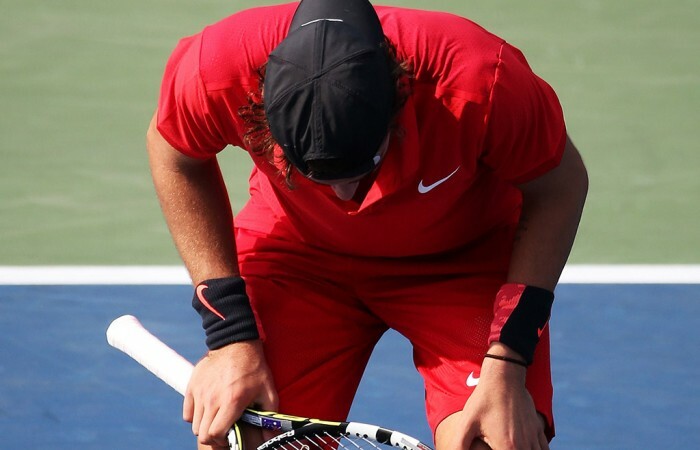 I'm like 'Oh, no, this is bad'.” With his family in the stands, Kokkinakis was extremely disappointed and frustrated, smashing his racket on the ground at one time.